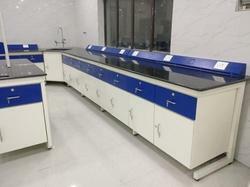 We are a leading Manufacturer of lab instrument table and laboratory instrument table from Coimbatore, India. We are the Leading Manufacturer and Exporter of Lab Instrument Table in Coimbatore, India. Available in accordance to international quality standards, we offer wide collection Instrument Table. They are provided with cabinets that are available in many sizes and configurations. This Instrument Table can also be customized as per clients requirements. We are the Leading Manufacturer and Exporter of Laboratory Instrument Table in Coimbatore, India.